So from time to time I want to share the wedding experience I've been having. I didn't really grow up dreaming about a grand wedding, so when life brought me to Arizona's heat all I knew was that my big day was not happening outdoors! The first thing we did after the bf proposed was pick a date which took some time to discuss our options and what would work best for both our families. In college I minored in event planning because weddings and organizing events had always peaked my interest! I think with my background experience I will be a much calmer bride to be (hopefully)! 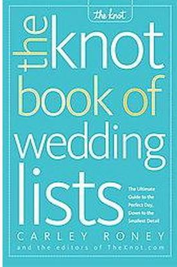 I do recommend you hop online - search around theknot.com or pick up a book! My mom picked this one up for us which tells you step by step what to do, as well the knot keeps track of a monthly and weekly to do list!! !